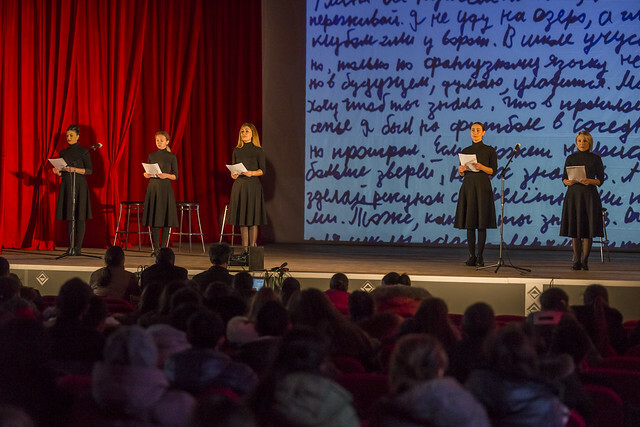 Stories of several women-survivors of violence from the ATU Gagauzia were staged by the Coliseum Arts Center, thanks to a multiethnic local initiative. The theatre play is named “I won’t let hope die” and is being staged in Russian language, with fragments in Romanian, Gagauz and Bulgarian. Actresses of the National Theatre “Mihai Eminescu” from Chisinau, Municipal Theatre “Smeshen Petek” from Taraclia, and National Drama Theatre in Gagauz language “D. Tanasoglo” from Ceadir-Lunga bring on stage real-life dramas of women exposed to physical, psychological and economic violence in their families. The cast include: Mihaela Strambeanu, Olga Gutu-Cucu, Natalia Ivanciuc, Elena Danaji and Diana Karapenkova. The initiative is supported by the UNDP and the Government of the Republic of Korea and is part of the UN’s global campaign “16 Days of Activism against Gender-Based Violence”. A premiere of the theatre play took place in Chirsova village (ATU Gagauzia) on 28 November, and a second staging will take place in Taraclia on 2 December. This performance will be also shown in one of the theatres of Chisinau. After each show a psychologist moderates a debate, to decipher the multiple forms of violence and convey messages about prevention and combatting of gender-based violence. The play’s director Luminita Ţicu notes that through this project she strives to contribute to building a violence-free society. “I think it is very important to discuss about domestic violence and engage in combating this phenomenon. A dialogue enabled by theatrical art is an efficient tool, because it sends clear messages, and not only at the theoretical or informational, but also at emotional level,” she tells. The project director Mihai Fusu believes that art can substantially contribute to the promotion of a non-violent behavior. “The message we want to spread through this show, first of all, is that woman’s dignity must be protected and every child’s right to a healthy family, education and their parents’ care must be promoted. At the same time, we have a message for men as well: we tell them that manhood does not mean violence, rather it means protection and care”, says Mihai Fusu. The youngest actress involved in the performance is Diana Karapencova. She is 17 and works at the Municipal Theatre in Taraclia. The girl plays in several shows and is a student of the local high school. Diana plays a young girl with speech disorders, who is abused by her violent father. “This theatre production is an extraordinary experience for me – sharing the same stage with professional actors and helping spread an anti-violence message. I have invited all my high-school peers and their parents to this show,” says Diana. This theatre production is supported by the project “Addressing violence against women in Moldova: exploring and learning from local solutions”, implemented by the UNDP and supported by the Government of the Republic of Korea. The project will help to establish support services for survivors of gender-based violence in the ATU Gagauzia. Women from five communities in Gagauzia, including Comrat, will benefit from psychological, social and legal counseling. They will also be advised to find a job or start a business. The pilot program will be carried out in Chirsova, a village in Gagauzia with 6,298 population, including 3,235 women. Supported by the UNDP, the community members will develop an action plan to prevent and combat gender-based violence. This document will allow the local authorities to establish the much needed services to stop and prevent violence, as well as to allocate and mobilize resources.